Displaying a some ironic sense of timing regarding his faith in the federal government’s ability to put together complex programs in a short time frame, the world’s first space tourist and founder of Inspiration Mars, Dennis Tito went to Washington yesterday, where in a prepared statement, he essentially asked NASA to assume Inspiration Mars concept as the first mission for SLS. 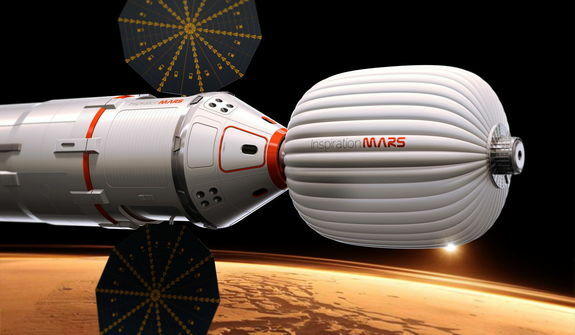 Mr. Tito’s testimony was accompanied by the release of a mission architecture study, (found here) which determined that the preferred option for the 501 day circumnavigation of the Red Planet be conducted with mission elements comprising an Orion based “return pod” and a habitation module based on Orbital Sciences Cynus spacecraft. According to the plan, the entire stack would be launched without crew into low Earth orbit in late 2017 aboard what would by necessity be the very first SLS 70 ton booster. In a hardware change from what is currently under way, the SLS second stage would need to be upgraded to the more powerful proposed Dual Use Upper Stage, rather than the more limited stage based on the RL-10 engine baselined. (After a $1.2 billion dollar development program, the far more powerful J-2X, which would have been ideal for this mission, was put on ice earlier this year.) Once the transit and return craft was in orbit, the two person crew would launch to LEO aboard NASA’s Commercial Crew Vehicle, rendezvous with the craft, and then depart for Mars. A number of things about the plan stand out, most of which are bad. But, starting with the good, the selection of OSC’s Cygnus as a possible crew habitation vehicle is somewhat of a surprise, given the presumption based on original presentation graphics which depicted an inflatable habitation structure. While it is curious that the inflatable option appears to have been dropped, it is also quite noteworthy that Inspiration Mars, and presumably many of the NASA people cited in the appendix to the study, recognize the potential of adapting at least this piece of existing hardware for deep space habitation. As for the rest, based on yesterday’s presentation, and on press statements reported later that Tito considers Inspiration Mars to be a “NASA misson,” it can be taken as sign that this concept is essentially dead, at least for the 2018 flight window. While one might wish that NASA had originally settled on the idea of a 2018 Mars circumnavigation some time ago, a spaceflight goal few would argue was not “worthy of a great nation” it stretches credulity to believe that even if it were willing, the agency could get the SLS ready on time. And as the GAO recently reported, Orion is further out still. All of which begs the question of why a proposal which was originally presented as most likely to be carried out with some combination of existing boosters; Atlas V, Delta Heavy, Falcon, and the soon to be introduced Falcon Heavy, has suddenly turned into a sales pitch for SLS. The explanation provided by Inspiration Mars is somewhat curious, and woefully incomplete. In the first place, the fact that the study teams were divided into a primary and a backup, with the former focusing on SLS and the latter looking at commercial options certainly suggests a built-in bias towards NASA’s mega booster from the start. Furthermore, the scant argument presented against commercial options, that it would require too many launches and too much orbital assembly seems highly questionable as well, even as it continues to conveniently underscore NASA’s ongoing justification for SLS based on the same line of reasoning. We are not talking about building the Death Star, or even ISS here, the Inspiration Mars plan as originally outlined called for two or three launches of commercial boosters, hardly a significant step up from the two launch scenario identified yesterday. Is it really that difficult to imagine that given five years advance planning, United Launch Alliance and SpaceX together could not manage three launches, which would all come from three different pads at Cape Canaveral Air Force Station, within a few weeks of each other? And all to the same orbit? Case in point, an Atlas V lifted off from the Cape this week, to Mars ironically enough, and the first East Coast Falcon 9 v1.1 is scheduled to lift off next week. Throw in a Delta Heavy the following week, and you have three supporting launches in 14 days. Furthermore, if SpaceX is ultimately successful in its attempt to secure the lease of NASA pad 39A, it is entirely possible that for any mission considered sufficiently worthy, an organizaon could field four launches out of the Cape in short order, with a possible fifth launch conducted by OSC aboard Antares coming out of the Mid Atlantic Regional spaceport. For the sake of argument, it could also be pointed out that if SpaceX does ultimately build its proposed commercial spaceport on the Texas coast, the total number rises to six, and perhaps most significantly, SpaceX itself could conduct three sequential launches short order. Finally, on the subject of commercial boosters, the insistence on making Inspiration Mars an “all American plan” rather unfortunately precluded consideration of other credible (and in some cases cheaper) hardware options including the Russian Proton, Ariane V, Japan’s H-II, as well as the ATV and HTV. And, as appears to have been the case, if the Falcon 9 family was precluded for some reason, it left the proposed “private” trip to be conducted aboard the two most expensive boosters in the world. Not good. Equally curious is the fact that for some reason, and despite already being overweight, yet another form of the Orion spacecraft has crept into the proposal as part of Inspiration Mars plan, even though, as the team points out, it would need to adopt a PICA based, rather than an AVCOAT heatshield, as SpaceX did with Dragon from the beginning. For reasons which are not at all clear, Inspiration Mars does appear to have dropped SpaceX hardware from its concepts, even going as far as to depict the Boeing CST-100 and and Atlas V as the graphic “examples” of the commercial crew provider. As for why Inspiration Mars did not proceed with an all ULA architecture, outside the immediate cost issues surrounding the Atlas and Delta products, one has to consider who owns the company. While ULA itself might be delighted to be providing the boosters destined to send the first Americans to Mars, its a pretty fair bet that that its ownership, the 50-50 joint venture between Boeing and Lockheed Martin were horrified at the prospect, due to the simple prospect that such an epic mission conducted without SLS/Orion, and years before the mega rocket conducts its first crewed flight, posed a bigger threat to the multi-billion dollar, multi-decade gravy train to nowhere than anything short of the Falcon Heavy. With ATK left at the launchpad as well, the original Inspiration Mars concept offered as much risk as it did opportunity. From their perspective, it almost had to be co-opted. From the outset, there was always something a little unsettling about the fact that even though Inspiration Mars was originally presented as a mission which could be conducted with commercial hardware, Dennis Tito seemed to go out of his way to affirm the necessary of building SLS and Orion as the one true path to landing on Mars. While that may still one day come to pass, at the same time, it seems unfortunate that a plan which seemed so very daring less than a year ago, is now little more than an appeal for a status quo which many believe is absolutely unsustainable. There will be other opportunities for minimum energy missions around Mars in the coming years, and perhaps realizing the writing was on the wall, Tito himself pointed to one in 2021. That mission however would take an additional 88 days compared to the 2018 launch window, and require a radiation enhancing path brushing the orbit of Venus. Maybe three more years will provide the time to put a better plan together, and even stock up on reading materials for the extra days. I would suggest starting with some poetry. 2 Comments on "Mr. Tito Goes to Washington (And Inspiration Mars Goes Off the Rails)"
You’re right to point out that this is essentially an admission that Inspiration Mars’ flight will not happen in 2018, whilst trying to shift the blame to NASA. The only reason I can think why Tito did this is because the other private donors needed to 100% fund the mission just weren’t forthcoming, and without that, basically the mission is dead in the water unless government wants to get involved. The pity of it is that this has been done in a way which puts the possibility of a 2021 mission to both Venus and Mars (a ‘twofer’ in terms of ‘firsts’) also into grave doubt. If Tito had simply admitted that the private donors weren’t there for a 2018 mission (which was anyway technically dubious) but that a 2021 mission was still possible AND meant a mission to Venus as well, they might still be in a better position to get private funding AND the help they would still need from NASA to actually make it happen.